The 2018 Business Book of the Year and winner of the Best Leadership Book at the 2018 Business Book Awards. 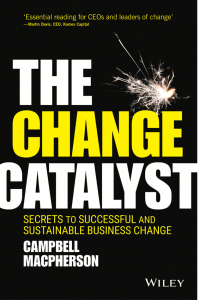 “The Change Catalyst is a book that frankly absolutely anyone in business should read. The writing is clear, clean, direct and simply beautiful. I found myself stopping and re-reading paragraphs just for the sheer pleasure of it.” Alison Jones, Head Judge 2018 Business Book Awards. The Change Catalyst is available in hard back or Kindle from Amazon.co.uk , Amazon.com and Booktopia.com.au.